Harvard's Chandra X-ray Observatory has captured an image of the a young pulsar, named PSR B1509-58. 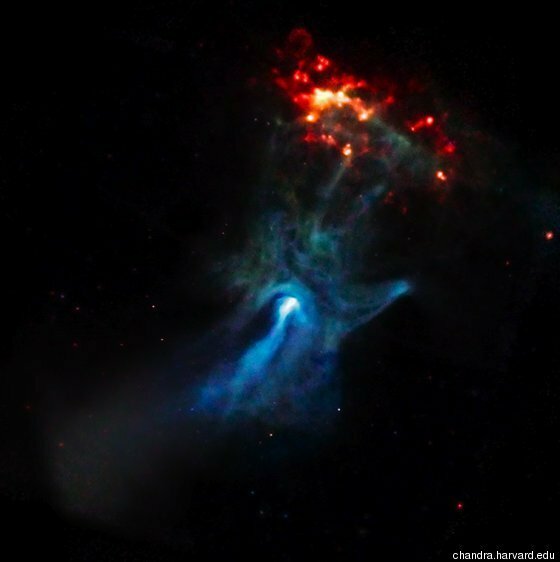 Located in the Circinus constellation, this spinning formation, which resembles a human hand, is about 100 light-years in diameter and about 17,000 light-years away from earth, according to NASA. In the image blow, red X-rays represent the lowest energies, the green are medium energies, and the blue are the high energies. The bright blueish-white light is the pulsar, which spans only 12 miles and rotates at a blazing speed of seven times per second. Finger-like structures extend to the north, apparently energizing knots of material in a neighboring gas cloud known as RCW 89. The transfer of energy from the wind to these knots makes them glow brightly in X-rays (orange and red features to the upper right). Tell us in the comments below what the pulsar looks like to you. Gizmodo described it as "God Gives Us High Five or Reaches for Cosmic Burrito." Check out more incredible space photos from NASA's sky-mapping spacecraft.